For the past year and a half I have been part of The Windy Pixel, a daily photoblog of urban and natural beauty. I ran the blog with Annie and Mike (those coming from tWp will be very familiar with these two folks), but the time has come for me to strike out on my own. The name for this blog comes from the writings and musings of Galen Rowell, who said that memory is a golden sieve which keeps the nuggets and lets the rubble pass through. His published words and photographs are a source of great inspiration and instruction for all photographers, myself included. I encourage you to read his books, support the Rowell Fund for Tibet and value wild places. My goal in creating this blog is to extend upon ideas I initially read about in Rowell's books and to dissect photography and memory and to understand how the two connect. Ultimately, I hope to make The Golden Sieve a center for great photography, writing and a place of beauty on the internet. What to do on the new site. This site is but half made. I have spent the past months slowly building design elements and content from the ground up for your enjoyment, but there is much yet to be done. You'll notice links at the very top of the webpage to buy photoshop actions, learn everything you ever wanted to know about HDR photography, and email me. There are also interactive gallery leads underneath the masthead (The City Gray and This American Giant) as well as an About Page where you can learn a bit about me and this blog. You can buy prints of my work, read my gear recommendations (and eventually reviews) and poke around the short list of websites I enjoy visiting in the sidebar. You'll also notice there is this neat little pull-out drawer in the upper left that has information about my twitter feed - follow me if you want to hear what I have to say. I encourage you to click around from page to page and check things out. Today's photograph is accompanied by a 55-minute tutorial that shows you how I produce these images from CF card to blog. Affecting memory with photography is partly a function of translating what we find so pleasurable about primary visual experience into the medium of digital photography. As I mention in my "Materials and Methods" page, I believe HDR photography is so exciting and interesting to many people because it simulates constancy phenomena that we experience every day. Shadows are never pure black, bright lights are never pure white - we perceive color and luminosity as a function of local environment - i.e. we make a subconcious calculation as to an object's brightness and color based on how it is lit. HDR is one of the only photographic techniques I've come across that triggers those calculations in a static, 8-bit image. What I hope you gain from watching the video is an appreciation of how to reproduce those phenomena and how to make great HDR images. Moreover, if you listen carefully during the video you'll be able to hear one of my cats meowing loudly as if to ask me what the hell I was doing talking to my computer screen late at night! There are several reasons I picked this photograph as the first for The Golden Sieve. First, I'm a bit of a geek, and as far as I understand, this is one of the first places that was photographed in HDR, and that makes it all the more fun to use as a template for playing with new "HDR" techniques. Now a member of the research community at Stanford University, I am proud to call this place home and was very eager to take my camera for a first visit to the crown jewel of campus. You will assuredly see many more photographs from inside the church in the future as it is such a great place for photography (if not a little overcrowded on the weekends!). Stanford University is a memorial in honor of Leland Stanford Junior, whose life was cut short and whose fabulously wealthy and industrious parents commissioned a school in his honor. The Memorial Church was built by Jane Stanford to honor her husband and as such is something of a memorial within a memorial. It is a golden and crimson space that is resplendent with light (making it a great first subject for HDR) and is the golden sieve writ in stone and glass. If memory captures and stores positive experience, then this building is a testament to the power of that sieving capacity. Of all the long years that the Stanfords shared, through their great personal tragedy and onward, they found it in their hearts to give and to produce something as noble as a University. What tremendous foresight they had in hiring Olmsted to design the campus and in setting up the trust so that it would remain large even when it had no use for its vast acreage. The university's flexibility and prime location (seriously it is beautiful out here) made it a natural birthing ground for the information age (here is a very interesting piece about how and why Silicon Valley is where it is). 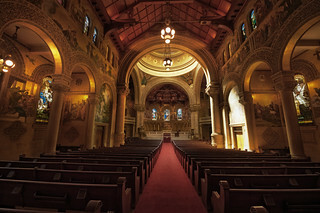 Through all this the Memorial Church has stood (despite serious damage during the 1906 earthquake) and has provided hallowed ground for the formation of countless golden memories of faculties, students, staff, and visitors. What better starting image could there be. My first attempts to gain access to the church having ended in some frustration (I seem not to be blessed here with the same luck of timing as I was in Chicago's Rockefeller Chapel), I decided to commit the hours to memory and return during a lunch hour some weekend while I was at work. The interior was cool but a little humid, crowded and lit by huge beams of noon sunlight that slammed off of the stone walls and created deep shadows and very bright highlights. There were tourists and visitors everywhere. I set up and waited for a lull in the activity. I've noticed people tend to move in groups, even when a group of people is composed of strangers. Perhaps we all heed social queues about when and where to walk and leave and come and go when in public spaces. Time ticked by and the church emptied, the heavy door creaking shut and leaving me to produce this series of images. During the last few exposures, a new group moved in through the door behind me and I held them off for a moment while the shutter counted down its seconds. Oh yes, I will be back.